David Hunter: A Brotherhood Story follows Scribe David Hunter as he fights to make the Commonwealth a better place but comes into conflict with Brotherhood traditionalists. David Hunter: A Brotherhood Story is the first of a planned serious of narrative-based mods set in each of the factions. The mod adds about half an hour to an hour of play if you do the bare minimum. All of the characters have fleshed out backstories which can be listened to or read about which will add time to the mod. There is also an extra quest which only appears if the player takes certain dialogue choices. Check out the trailers in the videos tab. David and Chambers are re-voiced - David Hunter and Chief Engineer Chambers have been completely re-voiced. My voice acting for David was pretty terrible so I hired a new voice actor to play him. The audio quality on the original Chambers was also quite poor so he has been re-voiced as well. Fewer Bugs - I remade this mod from the ground up so it's entirely new. That means all the old bugs that people identified, but the structure of the mod's scripting made fiddly to fix, have been fixed. My scripting knowledge has improved a lot since I first made BoS Story and so this mod is much more streamlined and efficient. Relationship with David - It is now much clearer when you have done things which please or annoy David, messages appear. Whether it is possible to become friends with, or romance, David has been changed to better reflect your actions over the mod's story. Minor Narrative Changes - The narrative is broadly the same as the original, but David has been changed from being a Paladin to being a scribe. I felt that made his interest in the dam more understandable. Rank Address - When David first meets you, he will address you by your rank rather than always treating you as a new recruit. Improved Interiors - The modded interiors have been improved. Peterson's Cape - Peterson wears a cape now. David can be found sandboxing the Main Deck of the Prydwen. Speak to him to start the mod. Sometimes he sits in Maxons quarters behind the ladder when you first enter so if you can't find him check there. The player meets Scribe David Hunter on board the Prydwen and he asks them for help with a project his is working on, he believes his project will better the lives of everyone in the wasteland. This project involves David operating outside of his official orders and also brings him up against Brotherhood traditionalists. This mod is intended to address the question of factionalism within the Brotherhood of Steel, those who believe in collecting technology, and those who still follow the old ways of Lyons. The mod is fully voiced, all characters are voice and both player genders are voiced using base-game dialogue lines. Excluding the player there are 743 lines of recorded dialogue. Include the player in that and it brings the total up to 981, more than that if you count both genders! There are only two main endings, but there is a great amount of variation in how the final scene pans out depending on player dialogue choices. In this mod, dialogue choices are what matter most. If you don't tell David something about yourself, he won't be able to tell it to another character which in turn will block a chance for you to relate to that second character. All the characters have backstories which they can tell you if you befriend them. Be wary, because certain options may cause characters to dislike you enough that they won't share! David remembers most of what you tell him. For example, he will remember your motivations joining the Brotherhood and may offer comment on them later. 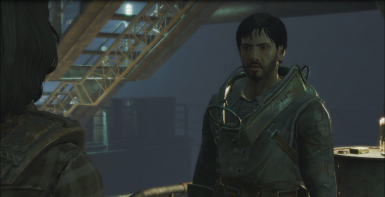 As well as being the protagonist of the mod, David can serve as a companion after the mod is completed. However, David cannot be commanded like ordinary companions. He works like companions from Fallout 3 and New Vegas. I did this because it was much easier to do it this way and I have no plans to make him commandable. This does mean that he won't sneak when you sneak or draw his weapon when you do, but at least he won't judge you for picking up junk. 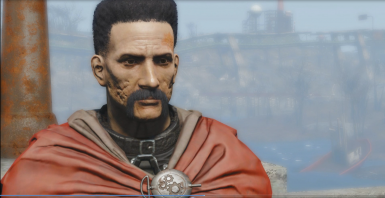 David doesn't much care how you treat other people in the wasteland, but he does care how you treat him and those directly related to the mod. If you are rude to David he will become annoyed with you; if you say things he approves of, he will be pleased with you. If you are rude enough to him, he will ask you to do a favour for him to regain his trust. If you are very rude it is possible to fail the mod, but you will be warned before this happens. At the end of the mod, the amount of nice choices you have made will be weighed up against the amount of mean ones. If you have made enough nice choices, and the pleased points outweigh the annoyed points, you will become best friends. You can also enter into a romantic relationship with David. This mod only needs the base game to run, however if you have destroyed the Prydwen you will not be able to access David. If you're already hostile with the Brotherhood you could still technically play this mod, but it might be a bit hard! This mod adds one new interior to the Forest Groves Marsh area and adds a few new things to the interior cells in the nearby dam. Aside from that the mod makes no major changes to the game world. There are a lot of possible ways the final scene can play out. I've played through it many times and I think I've ironed out all the bugs, however it is possible that there might be some that I've missed or a combination of dialogue lines that I've not accounted for. This is the most likely area for there to be bugs with the mod. The mod is playable from start to finish with no bugs, both myself and my brother have done it, but it's always possible I've missed something. If you have already downloaded a version below 2.0, do not run both those files at the same time: they are incompatible because this is a whole new .esp, completely remade. If you are playing for the first time just download the BoSStory file, version 2.0 of this mod, and play it.